I always find Austrian food a bit weird. 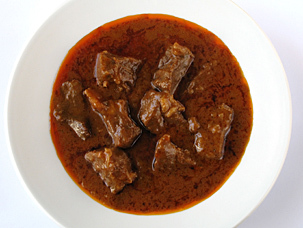 For example, when I order Goulasch, which I love; it’s a lovely, rich and tender beef stew, I ask, ‘Where are the peas? No carrots? Not a bit of broccoli? Not a bit of mash or any kind of spud?’ It comes only with pieces of bread, not even with any butter. Or sometimes, it comes with a big lump of a dumpling and I ask, ‘Honestly, who eats dumplings these days?’ It’s the same with other dishes; they come with some form of meat, usually a massive chunk of meat, and other than a bread roll, or a bit of horseradish or sauerkraut, that’s it. There is a distinct lack of greenery on traditional Austrian plates, and mashed potatoes. I was having a moan about the food one day when I started thinking about my favourite English food, of which there is a lot, but in particular I started thinking about ‘a chippy tea’ which is always the first thing I have to eat when I go back to the UK. 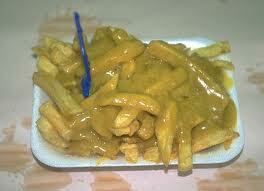 In the summer I was back and, as is customary, I ordered chips and curry sauce from the chip shop. I stood at the counter eagerly awaiting that portion of chips with its gloopy, lumpy, luminous, off-yellow curry sauce congealing on top. I started eating straight away and when asked what it was like, my reply was, ‘The chips aren’t soggy enough.’ So, I had to wrap them up again and wait until I got home so that the chips had sweated nicely in the paper. And disgusting as it sounds, and looked, it was delicious. Can you imagine someone from another culture being faced with such a dish? They would be horrified and, probably, rightly so: our opinions about food are shaped by our culture and mostly by what we grew up with. At the weekend, I was sitting outside a little wine tavern in the hills enjoying the sunshine and a glass of white when the couple opposite started chatting to me. The conversation turned to food and, predictably, they said they didn’t like English food. Out of my English politeness, I decided not to reveal my long list of disappointments with Austrian food, but listened with unexpressed annoyance to their complaints. For them, it all comes down to the bread; Austria has superior bread, which for them is the perfect accompaniment to any dish. All I could think about was how you never get given any butter to go with it.